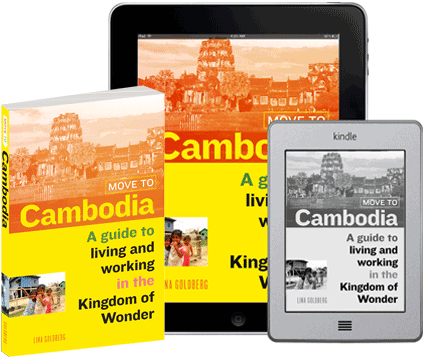 How to get in and out of Battambang, rent bicycles or motos, plus our favorite tuk tuk tours. Battambang is a walkable city, in that most of the Western-oriented business are centered in the blocks around and to the south of Psar Nath. Pick up a free copy of the Siem Reap Canby guide, they have a small Battambang section with a good map that can help you navigate. 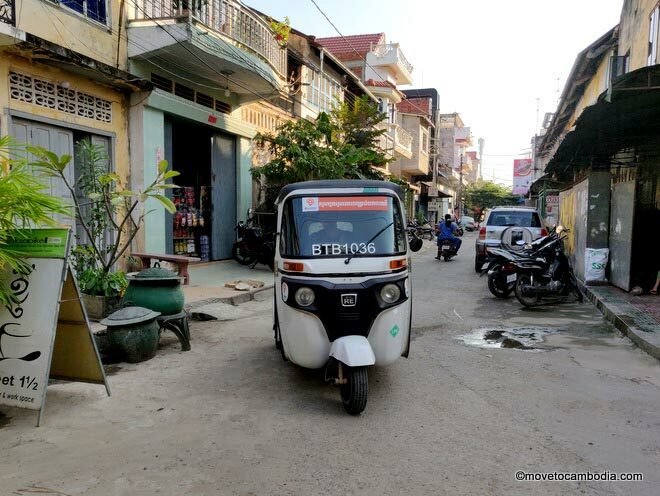 Getting around Battambang…transportation options from tours to on-demand tuk tuks. That said, most of the sightseeing is outside of town and you’re best off hiring a tuk tuk for a day or half day. For a tuk tuk driver and guide, prices range between $10 and $15 for a half day and $18 to 25 for a full day. You get what you pay for, and the drivers who speak the best English and act as much as guides as drivers charge on the high end of that scale. 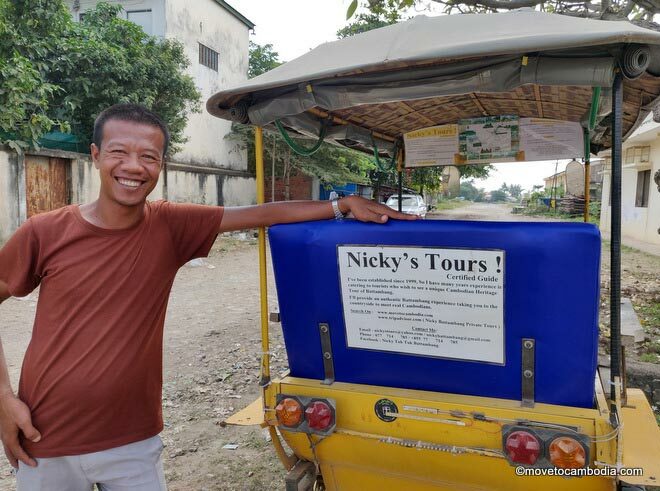 Nicky is one of Battambang’s most popular tuk tuk drivers. 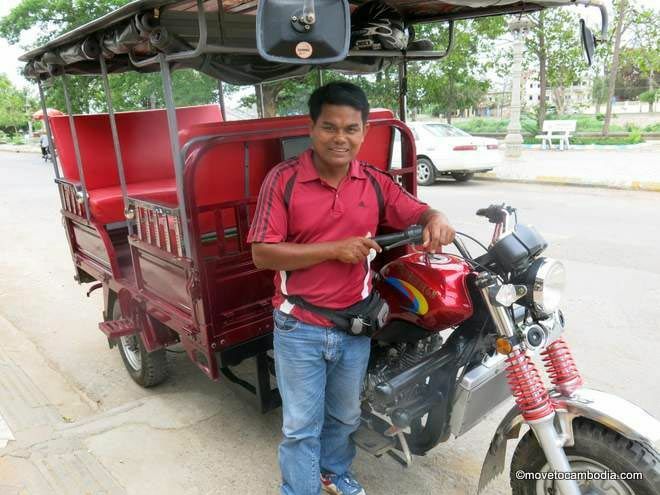 Tuk tuk driver and tour guide Samnang will take care of all of your touring needs. Samnang is an incredibly friendly tuk tuk driver who speaks excellent English. He’s a skilled tour guide as well as a good driver and can come up with a tour tailored to your interests. For example, foodies can visit the home of a family that makes rice noodles for the popular Cambodian dish num banh chok, see the making of rice wine and rice paper wrappers for spring rolls, learn how local banana chips are made, see the fish market, and visit the local winery. He also does more typical tours of Ek Phnom, Phnom Sampeou, Phnom Banan, etc. Samnang’s tuk tuk is quite large and can comfortably seat four or five people. Prices range from $15 to $25 for a half or full day, depending on the itinerary. He’s very popular and lives out of town, so try and call him a day or so in advance to reserve a tour. If you’re not looking for a tour and just want to go somewhere specific, you can easily flag down a tuk tuk. We’ve got a handy guide for everything you need to know about how to take a tuk tuk in Cambodia. If you just have one or two people, you can also use the Grab app (it’s the Southeast Asian answer to Uber) and hail an Indian-style tuk tuk that seats two, as seen in the photo at the top of the page. You will need to pay in cash whether you hail a tuk tuk in person or via the app, and they will almost certainly not have change so be prepared with small bills. You can rent bicycles for $2 per day through Soksabike, which is located in the Kinyei coffeeshop. They also rent mountain bikes for $5 per day, as well as offering a range of different bike tours around the countryside. The Gecko rents motos for $7 per day or $5 per half day (fewer than 5 hours). Rates include a helmet. 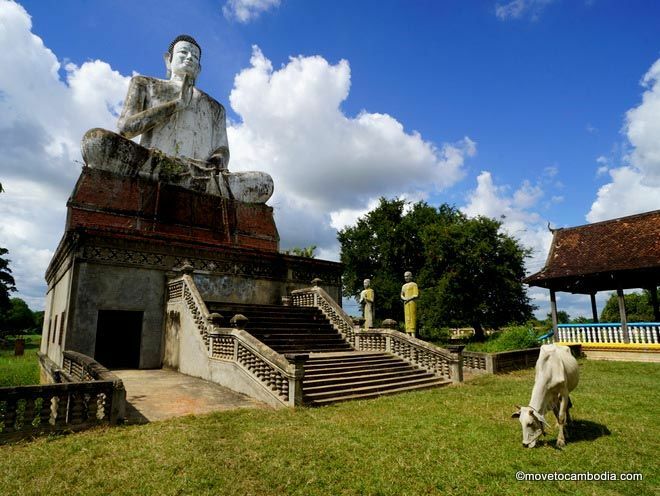 Battambang Bike offers a range of bike tours of Battambang, including architectural tours and custom-made tours. They also rent bicycles for $2 per day, including the use of a helmet. Getting to and from Battambang is easier than you might think! 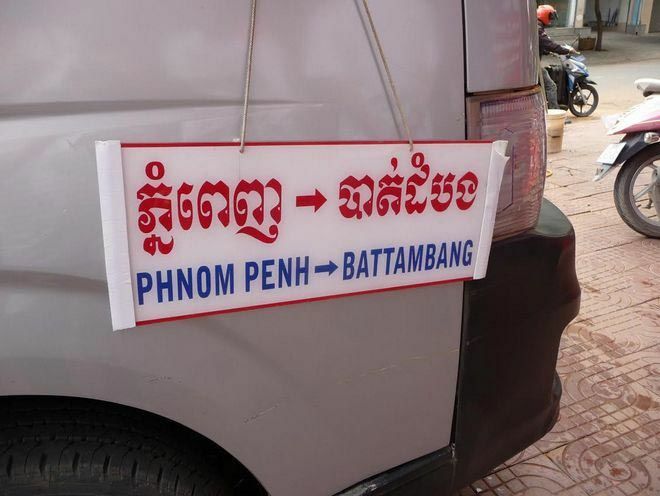 Check out our detailed blog post for information on how to go from Phnom Penh to Battambang (or Battambang to Phnom Penh) by taxi, bus, or mini-bus. We cover all the ways to get from Battambang to Sihanoukville (and vice-versa) whether you want to travel overland or combine flights and buses to save time.